Forest fires are major disasters that destroy many forest resources and damage the ecological environment. For millenniums, Forest and wildland fires have been taking place and shaping landscape structures, patterns and even the species composition of ecosystems. These fires are considered important for natural ecological processes initiating natural exercises of vegetation succession. However, artificially planting these fires and the misuse of it can cause tremendous adverse effects on the ecosystem and human society. According to Wildfire Today, Wildfires consumed 9.7 million acres of land in the United States just last year, in 2017. The number of acres burned in the country was almost at an all-time high – it came close to breaking the record! While this may not come as a surprise to many – according to the U.S. Department of Interior, 90% of the wildfires were caused by people. Most of these human-caused fires are due to intentional acts of arson, campfires left unattended and even carelessly discarded cigarettes. For our curious minds, here is the list of the largest wildfires in the world. Remote sensing has been identified as an effective and efficient tool for monitoring and preventing forest fires, as well as a potential tool for getting an in-depth understanding of how forest ecosystems respond to them. Through the use of remote sensing and GIS-based technology, forests can be monitored on a daily basis. If you’re interested in reading more about the power of daily monitoring, please click here. In comparison to the conventional methods of data collection, satellite-based remote sensing provides the following advantages. Semi-automated computerized processing and analysis via algorithms, etc. Satellite remote sensing is well suited for assessing the extent of biomass burning – which happens to also be a prerequisite for estimating emissions at regional and global scales. This information can help authorities to better understand the effects of fire on climate change. Improved remote sensing techniques also have the potential to accurately date older fire scars and provide estimates of their burn severity. 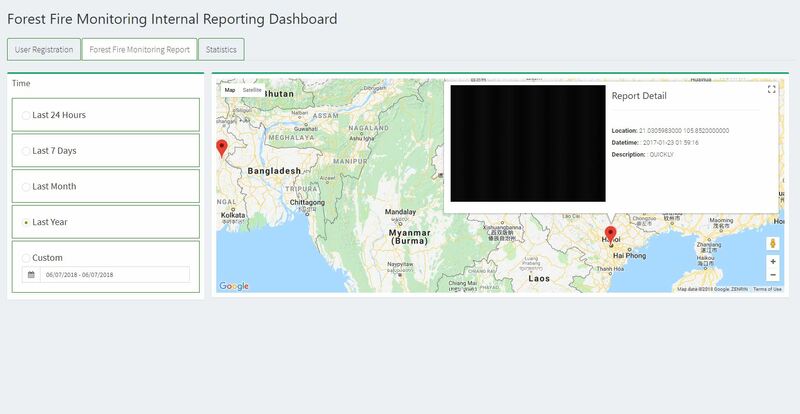 Through this dashboard, there can be near real-time information on forest fires across a given area. Area of interest (AOI) can daily be monitored and reported to officials in charge of forest security and safety. This satellite image has been taken of an AOI in India from the SkyMap Global team and shows an appropriate example of a system in place. With an end-to-end solution, reporting and taking action can happen with immediate transparency. Implementation is also very simple. Knowledge of these affected areas can aid understanding of the unique structure and dynamics of the vegetated landscape. Most of the world’s burnt biomass matter is from savannahs. Approximately ⅔ of the Earth’s Savannahs are in Africa and as a result, the world’s second-largest continent is now recognized as the ‘Burnt Center’ of our Planet. Click here to see NASA’s recent bird’s eye view of the continent. Every year from January to March (as these months usually bring cool and dry weather – the perfect conditions for burning), vast numbers of small fires spring up across the countryside in Southeast Asia. These people set fires for a myriad of reasons. Ranging from swidden agriculture to mushroom hunting – as burning the forest floor makes it easier to forage. Every dry season, parts of Indonesia’s Sumatra, Papua and Kalimantan areas are burnt down as palm oil and paper-and-pulp plantation farmers burn forests to cheaply clear the agricultural land. The downside? A LOT of smoke. In 2015, due to these activities, a toxic haze had wafted over huge swaths of Southeast Asia. This caused school closures, canceled events, and widespread concerns about public health and safety across the entire region. Some of the country’s pharmacies even began to sell bottled oxygen! The forest fire is a major cause of degradation of India’s forests. According to a paper written by NRSA, it is estimated that the proportion of forest areas prone to forest fires annually range from 33% in some states to over a staggering 90% in others. In recent years, state forest departments around the country have been forced to accept the fact that Indian forest fires are not the result of spontaneous combustion due to natural factors, but are rather set by humans. Also, India has recently witnessed a 125% spike (from 15,937 to 35,888) in such fires in just two years (2015-2017). In three years, forest fires have devoured 875 hectares in the Pune district itself. Now more than ever, India needs to harness the power of GIS and remote sensing capabilities. To prevent these calamities, the forest department of India has announced to use GIS especially during the ‘Fiery Months’. To read more about the department’s announcement, please click here. The effects of all these fires add up and make a significant impact on the big picture. With populations rising and the amount of farmland increasing, fires in Southeast Asia are estimated to be responsible for at least 10% of global wildfire emissions. Satellite images have a considerable value in preventing and handling of burnt areas. Explicit knowledge about these areas can aid in the understanding of the structure and dynamics of the vegetation in the landscape. Forests, being a renewable resource, can slowly be regenerated through sustainable management. By leveraging the power of GIS and RS, important information on forests can be analyzed and evaluated to make well-informed decisions. If you wish to read more about remote sensing and it’s applications in a variety of industries, please click here. I am a student, studying geoinformatics from central University of JHARKHAND Ranchi . Sir my Mtech project was going on “forest fire” topic so sir I am very much interested to know how can I use machine learning algorithms in forest fire. It is humble request to you sir if possible I want to do 3 months training at your institute.